As a new composite material, Polycrystalline diamond compact (PDC) has only a history of more than ten years, but its application range has been developed to all walks of life. Its surface is polycrystalline diamond sintered from powders of different diamond sizes, which has a high hardness, wear resistance and a long working life; The underlying layer is generally a tungsten-cobalt type hard alloy, which has good toughness and provides good support for the surface polycrystalline diamond, and Easy to solder to various tools. At present, the polycrystalline diamond-carbide alloy composite sheet is generally manufactured at a high pressure and high temperature sintering method in domestic and foreign. As its usd scope expands, its performance requirements increase, and the corresponding performance detection method has also undergone a rapid development process, and the accuracy and effectiveness of re-detection tend to mature. Widely used in oil and gas drilling. The reason why pdc are so widely used is mainly because they have unparalleled superior properties compated with other materials. (1). High hardness and wear resistance (wear ratio). The hardness of PDC is as high as about 8000 HV, which is the hardest material in man-made materials in the world at present, and it is much harder than cemented carbide and engineering ceramics. Because of its extremely high hardness and isotropy, it has excellent wear resistance. 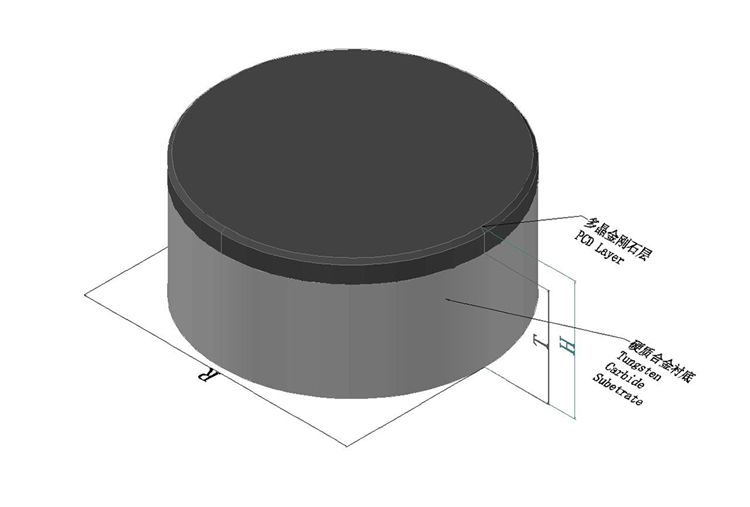 Generally, wear ratio is used to reflect the wear resistance of PDC. Now the wear ratio is about 8 to 300,000. (2). Thermal stability. The thermal stability determines its scope of use. The thermal stability of the PDC means heat resistance, which is one of the important performance indicators for measuring the quality of PDC. Thermal stability refers to the heating to a certain temperature in the re-atmospheric environment (with oxygen present), the stability of the chemical properties of the polycrystalline layer after cooling (the degree of diamond inking), the change in macroscopic mechanical properties, and the effect of the bond strength of the diamond working layer interface. (3). Impact toughness. As a cutting tool, PDC is widely used in oil and gas drilling . During the drilling process, due to the combined effect of axial force and horizontal cutting force, friction between the drilling tool and the hole wall, bending of the drill string, uneven hole bottom, residual rock powder, and vibration of the drill, etc. PDC has been greatly impacted. The impact resistance of PDC reflects the toughness and bond strength of the PDC. It is a comprehensive performance index and also the key to determining the effect of the use. In the mid and late 1990s, a large number of mirror-polished PDC for drilling were used. The polished diamond surface is considered to be more conducive to the chip swarf removal of the diamond composite, reducing the probability of mud packs in the pdc drill bit, and significantly increasing the drilling speed and prolonging the service life of the bit.